Past month has been really hectic in terms of professional and personal terms. So hectic that I missed seeing the daffodil and tulip bulbs that we had planted last year sprout (is that the right word?). I missed noticing how the temperature has been slowly rising to double digits. I missed hearing birds chirping happily in our back garden. I missed to notice that it’s not pitch dark when I leave to my office and when I come back to home from work. I missed so many things till yesterday when I bent to pick the coins that had fallen from my hands and saw these lovely, delicate purple and yellow Crocuses beaming happily at sun. Yes, spring is in the air… little early perhaps but it is almost there! I stopped on the track to admire those little beauties for a while before rushing to finish my work. The delicate petals of Crocus were fluttering in cool breeze and they looked like a small, happy kids playing in a park, the radiance on their face competing with that of the sun god! The little flowers looked like a bunch of happy kids, their smile so infectious that you can’t help but smile and laugh with them. I just spent few minutes admiring them and I felt good, really good for that matter! (Now you know the reason behind my template make over. It reflects my mood... Cheerful and alive!) Don’t you think its little pleasures like this that uplifts our spirit and makes us happy? And Bisi Bele Huli Anna or Bisi Bele Bhath or BBB is one such thing that falls into small pleasures of life! 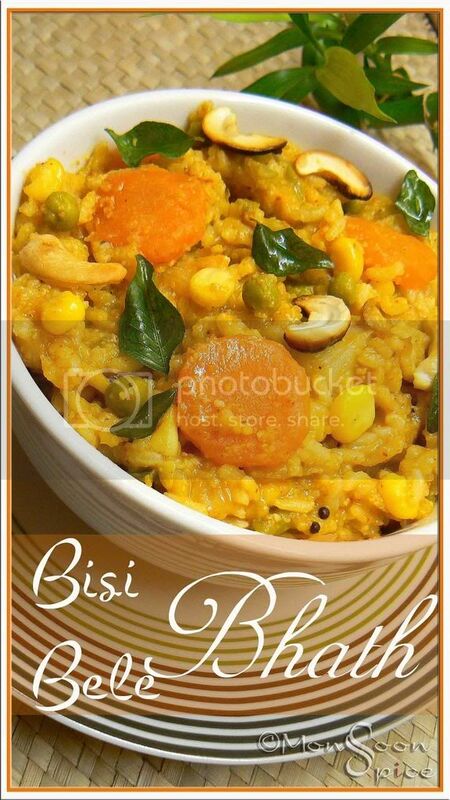 Bisi Bele Bhath is a classic rice dish from Karnataka and one of the most loved comfort food. Bisi Bele Huli Anna may not be the pretty, photogenic dish but the its taste more than compensates for everything. 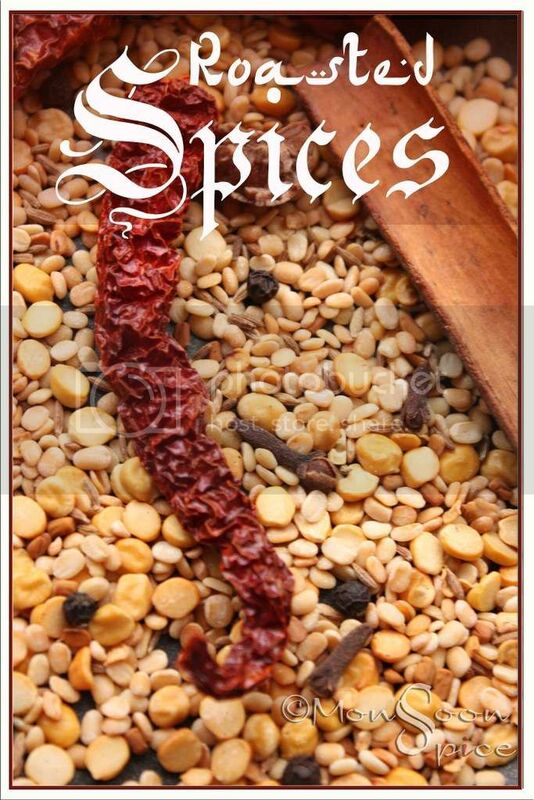 It has got heat from that lovely roasted spice powder, hint of sweetness from jaggery, and tangy note from tamarind. But most importantly it is one pot of rice and lentil medley packed with proteins. I usually make fresh batch of Bisi Bele Bhath masala powder but you can also use store bought ones (MTR being the next best thing to homemade). Serve BBB with Raita or Chips/Papad and see your loved ones falling in love with this classic, down to earth dish. This is my humble entry for Susan’s lovely event My Legume Love Affair. Heat the pan and add all the ingredients except desiccated coconut and turmeric. Dry roast them on low heat till the lentils turn light golden brown in colour and the spices are aromatic. Transfer these roasted spices into a dry coffee grinder or mixer and wait till they are completely cooled. Once cooled, mix in desiccated coconut and grind them to fine powder. Store this aromatic Bisi Bele Bhath Masala powder in a dry, air tight container and keep refrigerated and use as and when required. The shelf life of this powder is about one to one and half months. Although you can cook rice, lentils and vegetables together I follow my mom’s recipe where all three are cooked separately. Traditionally, rice, lentils and vegetables are cooked separately and then mixed together. I find cooking them separately gives it more taste than putting them all in one pot and cooking. 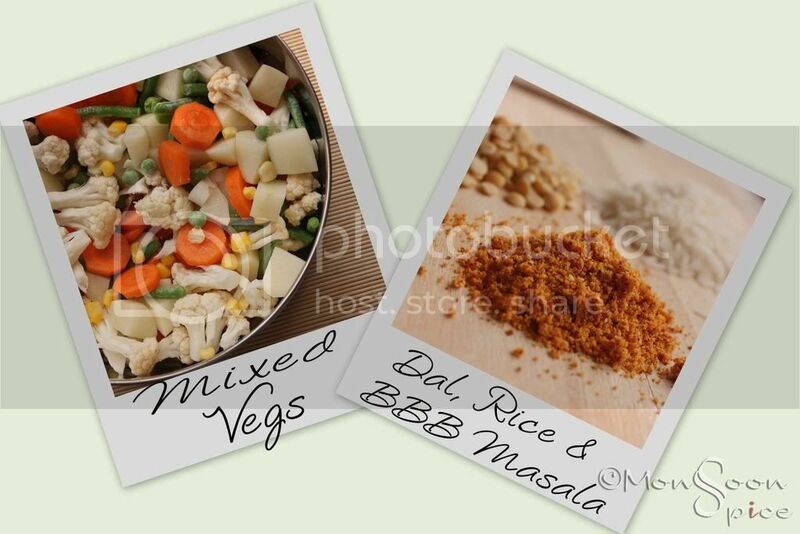 I usually cook my rice in microwave and pressure cook vegetables and dal in two separate bowls. This works well for me. You can also mix vegetables with rice and cook them together and later mix them with cooked lentils. Wash rice and lentils separately till water turns clear. Add 4 cups of water to rice and cook it in microwave bowl for 20 minutes. If using pressure cooker, then 2 whistles is enough. Add 2-2 ½ cups of water to dal along with few drops of water and turmeric powder. Cook this dal in a pressure cooker along with vegetables (with little salt) for 2-3 whistles till lentils are cooked well. I usually add more water when cooking the vegetables as I like the veggies to be little mushy and blend well with rice and lentils. And the excess water from cooked vegetables is used in BBB for little runny texture. 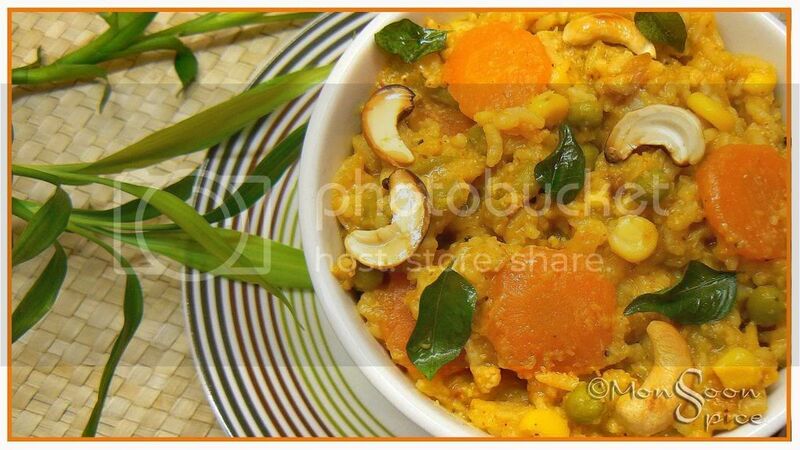 While the rice, vegetables and lentils are cooked, make tamarind puree, bisi bele bhath powder, and slice the onions. Once the dal is cooked mash it with a potato masher. Don’t worry if it is too watery. Keep mashed dal, cooked rice and vegetables aside till needed. Heat oil or ghee in a pan and add mustard seeds to it. When it starts to pop and splutter, add urad dal, channa dal, hing, broken red chillies and curry leaves. Saute till lentils turn golden brown. Next add sliced onions and sauté till they turn light golden brown in colour. Mix in mashed dal, tamarind juice, BBB masala powder and jaggery and bring them to gentle boil, about 3 mins. Then add cooked rice and vegetables along with excess water and mix them well. Make sure that the BBB is runny by adding little more water if needed. Adjust the salt. Mix in fried cashews and serve piping hot with little Ghee and papad/chips and cold Raita and enjoy this heavenly bowl of goodness. 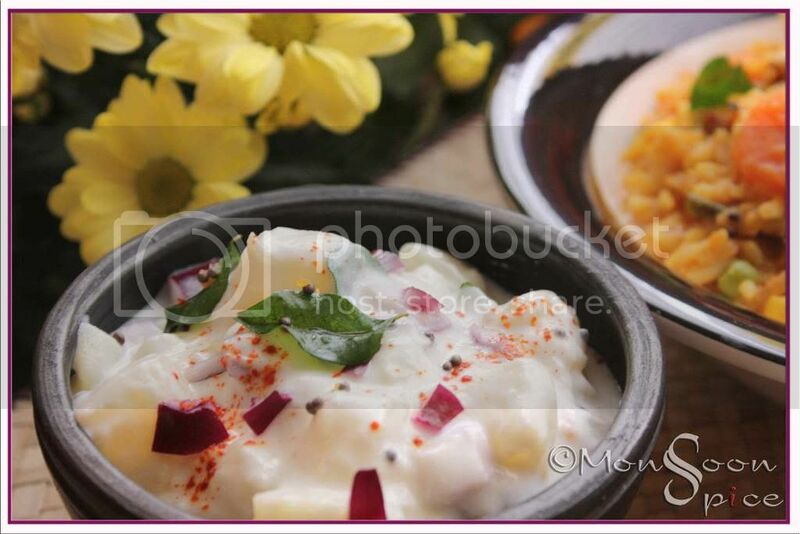 You can serve any type of Raita or just plain yogurt with BBB. But my favourite Raita to be served along BBB is Aloo/Potato Raita. It is refreshing and unbelievably simple to make. Unlike most raitas, Potato Raita uses cooked vegetable and here it is boiled potatoes (obliviously!). The creamy yogurt gently mixed with this root vegetable along with sweet onion, hot green chillies and aromatic Tadka is one helluva of flavour explosion in mouth. And when served with hot BBB… Well, why don’t you try it for yourself and see! Mix in yogurt, cooked potato pieces, coriander leaves, chopped chilli, and salt to taste. Heat oil in a pan and mustard seeds to it. When it starts to pop and splutter, add hing, dry red chilli and curry leaves. Saute for few seconds and then transfer the Tadka to raita and mix well. Chill the Potato Raita in fridge till required and serve it along BBB sprinkled with little chilli powder on top. i just prepared this dish a couple of days bak and have posted in my blog.Urs look amazing with raita.awsome pic as ever. Wow,both of these look beautiful ! Classic dish BBB and Raitha. I always make fresh powder while making BBB. Possibly the best one dish meal! awesome pix! BBB looks very good! It is my second love. First being Vangibath! The BBB is calling me now! Just gorgeous the rice! Looks so yummy this is yet another dish i have neve rmade home, but at in placces. And you prepare them in a jiffy. Wow awesome....I love the spicy and aromatic smell coming from BBB.....Potato raitha is new to me,,,Looks yum. Looks mouthwatering. I haven't made BBB in a long time. BBB is perfect for Shiva Ratri in fact. I will be cooking a simple thali too compared to huge Hrayanvi thali ie! HeHe!! Arvind is not going to be home on Sunday and Monday, so I will be making habbada oota tomorrow, so will be cooking today all day. Have fun reading and relaxing, hugs to you. Yes we r seeing signs of spring here too! much to our relief. I love ur new blog heading. I love BBB. It's one of those meals-in-one with carb, protein and veggies all married perfectly. And I agree, raitha and chips/boondhi/sandige make the best accompaniment! Loved the look of yours. I don't use jaggery in mine though. truly simple pleasure. our all time favorite. I'm going to try it with your BBB spicemix. Simple flavors indeed, but how delicious. Bisi Bele Bhaath is a favorite here. Everything looks gorgeous, Sia. Love BBB anytime looks yumm. 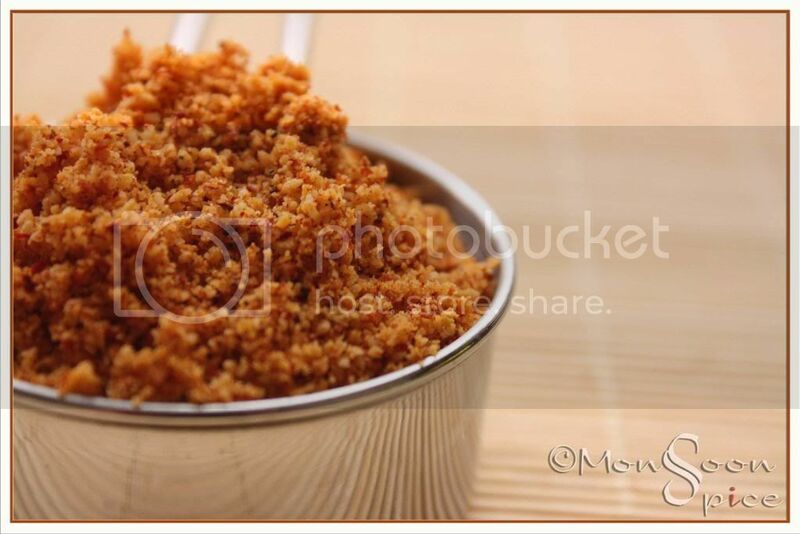 I love to have it with masala bhoondi and feel its incomplete without them, dont know why? Nice and comforting BBB ( nice abbrevation ). Love them hot hot with that raita which makes you feel in heaven. I liked what you said about the flowers! So true. I miss our garden so much from the time I have started living in a flat!! The flowers used to brighten up the day and were a sight to admire! beautiful pictures sia...bbb is a fav anytime! You already have crocus pushing up? Wow, that is an early spring! Sia, this is a lovely recipe, much prettier than you give it credit for. And I can tell that it tastes gorgeous! Thanks for sharing it for MLLA8! he he he I just made puliagole yesterday for lunch...love ur bbb. yum n spicy! Your blog is amazing...I being a mangalorean, was so happy to see the well known dishes here.I tried out the BBB and it turned out awesome...I felt so happy to recreate what I craved for. Thank you very much. Keep up the good work and keep adding many more veggie dishes. My kids just love this Sia, but I have to confess I never make it. My nanny does. I guess I better give it a try!